LubriSyn HA Plus with MSM for Equine & Pet Hyaluronic Acid is a naturally occurring component of joint fluid. It can only be supplemented by injection or by oral absorption. In studies, MSM (methylsulfonylmethane), has shown to relieve symptoms associated with osteoarthritis. These vital elements have come together to create LubriSynHA + for a natural, synergistic, anti-inflammatory effect. LubriSynHA Plus helps support your horse's connective tissues, is a natural antioxidant, and assists equine muscle tissue rebound from exercise stress and soreness. Highest Molecular Weight HA - Non-invasive Joint Support - Fast Acting (7-10 Days) - All Natural Ingredients - Gluten Free - BPA Free - Made in U.S.A.
PROMOTE JOINT STRENGTH AND HEALTH: Advanced LubriSynHA + MSM is a powerful joint lubricant and anti-inflammatory for your feline, canine and equine companion, supporting hip and joint mobility and protecting the structural integrity of cartilage and connective tissues. FAST-ACTING + MOVE MORE EASILY: Daily use of hyaluronic acid (also known as hyaluronan) fortified with MSM has been shown to work quickly and synergistically to combat whole body stiffness and joint pain associated with overuse, injury or osteoarthritis. Ingesting hyaluronic acid as a liquid has been proven in various studies as the best, most effective and most rapidly absorbed form of HA since it is found naturally in joint fluid. MULTI-TARGETED FORMULA: While glucosamine and chondroitin target cartilage instead of joint fluid, high-molecular hyaluronic acid has been shown to lubricate and support joints, cartilage, tendons, connective tissues and ligaments. MSM is an effective anti-inflammatory agent and works as a natural antioxidant in the body. 100% NATURAL, ORGANIC AND VEGETARIAN: Unlike other liquid hyaluronic acid supplements sourced from animals, the hyaluronic acid in LubriSyn's formulas is extracted from a microbial source, making it vegan and gluten-free. This bio-identical synovial fluid most closely matches the hyaluronic acid found naturally in your pet's body. Our FDA-registered facility is GMP-certified, and our products are manufactured in the USA in small batches to ensure the highest quality. 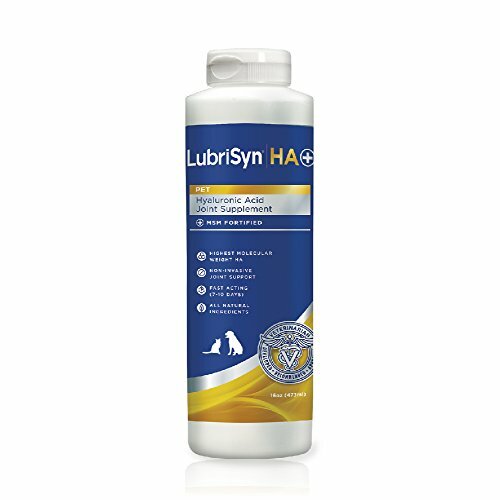 POWERFUL FORMULA FOR ANY PET: Lubrisyn HA + MSM Joint Supplement is intended for pets of all shapes and sizes; whether for preventative purposes - high-level performances, intense exercise and play - OR - mobility purposes, such as hip dysplasia, older pet arthritis or injury - our joint support liquid can be used for any small, medium or large dog, cat or horse.